In fair-good condition with normal discoloration, a few corner creases, small edge tears and some pinholes all over. Imprinted on the back is Cozy Theatre 320 South Broadway Los Angeles, Cal. Please refer to photos provided. 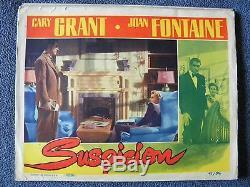 The item "VINTAGE ORIGINAL 1941 SUSPICION LOBBY CARY GRANT JOAN FONTAINE 41/316" is in sale since Sunday, March 26, 2017. This item is in the category "Entertainment Memorabilia\Movie Memorabilia\Lobby Cards\Originals-United States\1940-49". The seller is "srazey03" and is located in Haverhill, Massachusetts. This item can be shipped worldwide.